West Central Area Schools and Thorson Library in Grant County and the White Earth Indian Reservation Tribal Council were two of six organizations receiving awards from the Minnesota Department of Human Services' new Family, Friend and Neighbor (FFN) Child Care grants program authorized by the 2007 Legislature. The FFN grant program was established to promote children's early literacy, healthy development, and school readiness, and to foster community partnerships to promote children's school readiness. Grant County's new Family, Friend and Neighbor Outreach Program is a collaborative effort that will provide training materials and children’s activities based on the Minnesota Early Childhood Indicators of Progress. The library will host play and learn groups and other special events following the ECFE model of child/adulttime together and periods of separate instruction. The focus will be on health, safety, nutrition andschool readiness. White Earth Reservation will work with Mahnomen, Becker and Clearwater counties to provide services to FFN providers. 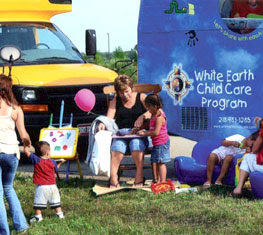 Monthly home visits with White Earth's Readmobile will be provided. Readmobile stock will be improved and books and other literacy materials purchased to give to the children. Materials and events in the Ojibwe language will be offered. Providers will be connected to local social services. The White Earth early childhood certified staff/trainers will provide assistance to, train and mentor FFN caregivers.